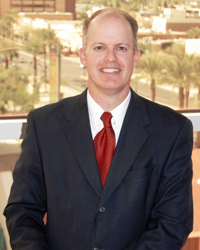 Ezra T. Clark, III has practiced employment and business law in Arizona since 1993. Mr. Clark represents employers in arbitration, mediation, internal and external investigations, litigation, and administrative proceedings involving the EEOC, NLRB, DOL and other governmental agencies. He frequently counsels employers on personnel policies, termination and hiring decisions, non-competition and similar restrictive covenants, employee disability issues, drug/alcohol testing, and wage and hour issues. Mr. Clark is experienced in defending employers against allegations of discrimination, wrongful termination, unfair labor practices, breach of contract and employment-related torts. For both employer and employees, Mr. Clark regularly drafts and reviews offer letters, employment agreements, independent contractor agreements, confidentiality agreements, non-competition and non-solicitation agreements, as well as separation agreements. Mr. Clark grew up in Mesa, Arizona and received his law degree from Brigham Young University. Mr. Clark has published numerous articles in national publications on preventive law topics and instructs business owners, human resource professionals, and MBA students at ASU on preventing employment law litigation. Mr. Clark is a sought-after speaker and frequently conducts in-house training sessions for employees and managers on preventive employment law topics. Rated “AV” by Martindale-Hubbell – the highest possible rating in terms of professional ability and ethical standards. © 2010 Clark Law Firm, P.C.. All Rights Reserved.